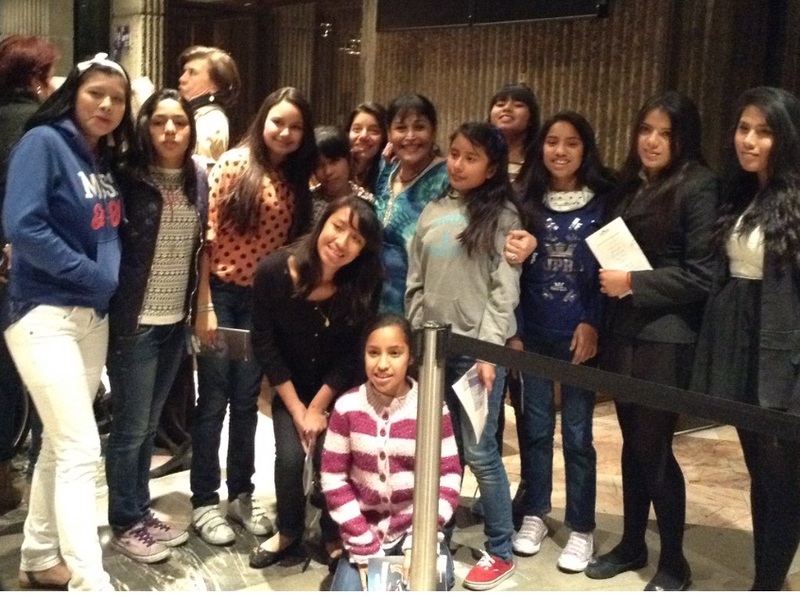 Last month, Rebecca Thompson and Mónica Saramiento of the US Embassy in Mexico City brought a group of fifteen girls to my concert in Sala Nezahualcóyotl. I enjoyed talking to them after the concert and promised to visit them in their home. A couple of weeks later, I had the opportunity of keeping my promise and had a really wonderful and meaningful afternoon with them. They all live in a well constructed home which houses seventy five girls who have been rescued from dangerous or abusive homes or from the streets and have found love, security and stability in one of the most remarkable homes I have ever seen. It was established by Ayuda y Solidaridad con las Niñas de la Calle and the girls have a wonderful family to grow up in. They all go to school and every one of them is learning to play a musical instrument! I found the visit very inspiring and I can’t wait to return and see them again. The home was established by La Junta de Asistencia Privada del Distrito Federal (JAPDF) a decentralised body which supports and monitors civil organisations that have been established as Private Assistance Institutions (IAP). In D.F. there are currently more than 400 institutions that are grouped into six areas of care (education and community development, disability and rehabilitation, health and addictions, children and youth, seniors and donors). Among its activities, JAPDF offers the IAPs all kinds of support and one of their many projects is “Celebridades con Corazón y Acercamiento Cultural”. Last weekend I went to Puebla and gave a weekend masterclass for the young flute players from the Orquesta Sinfónica Esperanza Azteca de Puebla and for some Conservatory students and this, too, was very inspiring. The Esperanza Azteca Music School has more than a thousand students in Puebla, housed in an incredible ex-factory called La Constancia, which also houses a Music Museum, a Puppet Museum and a Concert Hall. It is a truly wonderful complex and if you have not already visited La Constancia you should make sure to visit it next time you are in Puebla! The first and original Esperanza Azteca Orchestra was established in La Constancia a mere six years ago and has grown into an incredible network of eighty two orchestras all over the Republic, in El Salvador and, now, one in Los Angeles as well. The orchestras are coordinated and supported by a dedicated team from Fundación Azteca and there are now more than sixteen thousand young people playing musical instruments all over the country! It is a truly remarkable organisation directed by Esteban Moctezuma and led musically by Julio Saldana who together guide a huge support team of teachers and administrators, all working to inspire young people in a musical direction. Esteban’s aim is to establish one hundred orchestras and I am sure it won’t be long before he achieves his goal! It is very important that we support each of these orchestras in whichever way we can – with practical help, financial aid or material contributions – in addition to attending their concerts, of course! Next month, on the weekend of 30 April, the Secretaria de Cultura is presenting ALAS Y RAÍCES, their annual Festival of Music for young people and I am both honoured and delighted to have been invited to participate. The Festival takes place over the two days, Saturday 30 April and Sunday, 1 May in the Centro Nacional de las Artes and I will give my concert with my colleagues of the Trio Amistad at 5pm in Sala Blas Galindo on Saturday, 30 April. I hope to see you there! Previous PostLife on the Road!